A washing machine is at the heart of any home. Whether you live on your own or have a household full of children and their (relentless amounts of) dirty washing, it’s fair to say that it gets its share of usage. This particular washing machine has a 7kg drum and a spin of 1400rpm, this makes doing the laundry easier for you and it’s more than capable of the amount of washing you may need itfor. The Samsung WW70J5555EW has a sleek white body colour, LED display panel and the aesthetic design will fit perfectly in any home, without garishly standing out. On first glance, you notice that it’s fitted with a large easy-to-open door that will provide you with hassle-free access to the 7kg drum inside. The drum comes with a diamond embossed drum design, this has been cleverly designed to prevent snagging on your clothes while simultaneously giving them a cushioned layer in every wash. The Samsung WW70J5555EW also comes with all the features that you would expect from a washing machine, such as a quick wash, wool wash, delicate wash, a reduce creasing option for those days when you’re not up to scaling the mountain of ironing! This washing machine also has 10 other programmes to choose from. You can even customise each setting to meet your specific needs and the wash times are generally quite quick. Onto the control panel: as stated, you can tailor your wash to your own personal needs or stick with the pre-programmed cycles that are already incorporated in the washer. The LED display screen has an easy to read font for you to select your preferred programme at the simple touch of a button. 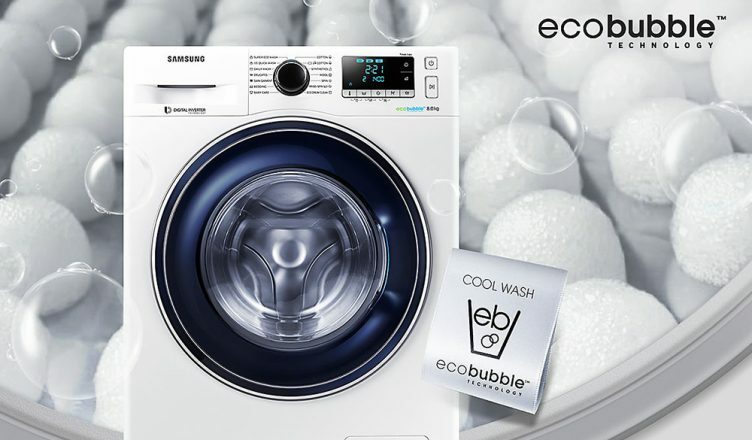 The Samsung washing machine uses an innovative technology called ‘Eco Bubble’, which delivers powerful cleaning, even at a low temperature. The Ecobubble technology does this by mixing together water, air and detergent to create bubbles thus removing dirt easily; this is kinder to the environment and it saves on energy bills – as there is no wasted energy from heating the water first. Ecobubble technology also treats your clothes kindly, meaning that they should last longer. You can of course still use a hot wash, when desired, as you can programme variable washing temperatures yourself. This washing machine also boasts a handy feature of Samsung’s Stay Clean drawer, perfect for those of you that hate the tedious task of cleaning out the built-up residue from the detergent; less wasted detergent also equates to money-saving. 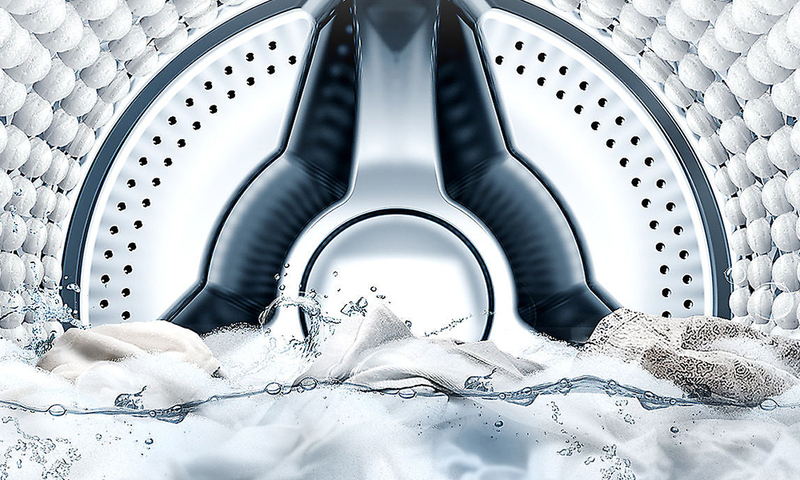 Detergent residue is washed away into the drum, thanks to the powerful water jets that this washing machine has. Put simply, with the WW70J5555EW you will get a more thorough wash for your clothes as the detergent gets transferred to the drum more efficiently. Washing machines, in any household, get used extensively, and because they’re a product with many moving parts – that all need to work in sync in a fine balance to be able to work to its maximum potential – they’re often considered items that get thrown away after a few years of use. 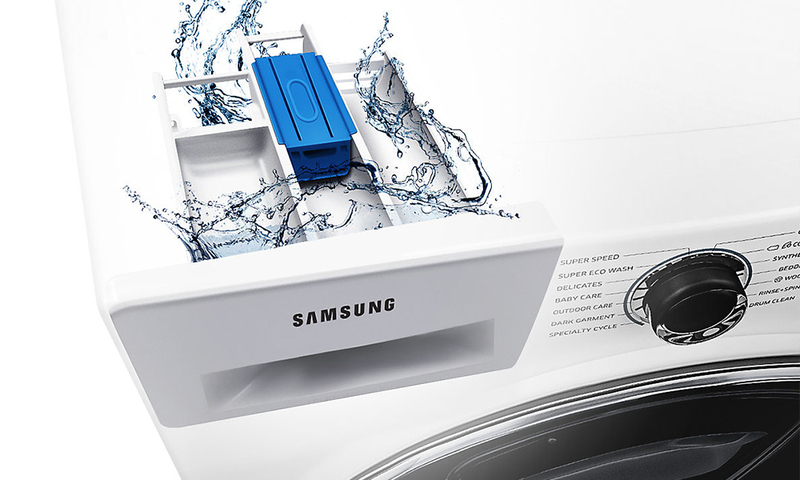 Most upmarket washing machines will come with one year warranty from the manufacturer, but Samsung provide you with a 5 year warranty, making sure you have peace of mind with the product when you get it home. If you think it couldn’t get any better than that, think again. Samsung have an incredibly handy tool called SmartCheck. The SmartCheck is a built-in monitoring system that will detect and diagnose any problems the washing machine has at an early stage, providing you with quick and easy solutions by using your smartphone. The app is available on iOS and Android smartphones. The convenience of the app will eradicate having to search through the manual to source your problem and it may also avoid the inconvenience and cost of having an engineer come out to you. Choosing a washing machine can be a huge ordeal as there are many to navigate round, from looking at ones with the best features for you or keeping the cost of at a low. But look no further, your nightmare shall be over, with the Samsung WW70J5555EW. 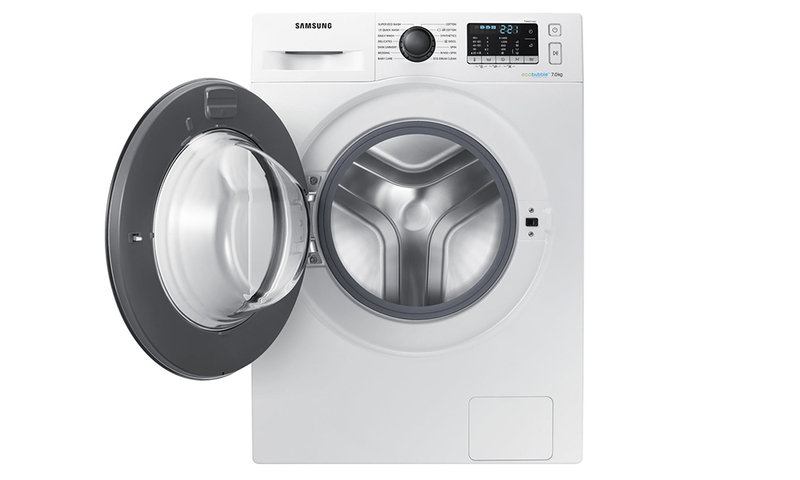 If you are looking for a washing machine that has a slightly bigger drum then it might be worth looking at the Samsung WW80J5555EW, this version boasts an 8kg drum. For any queries why not pop into your local store and there you will be able to speak to one of our lovely sales advisors who are really knowledgeable about these products and can advise and guide you with your needs. You can buy the Samsung WW70J5555EW online, use our Click & Collect service to get this machine in as little as one hour or get it delivered straight into your home for easy convenience.